Home gyms can end up costing you thousands, especially if you end up trying to buy expensive machines or free weights for your home. This equipment is an attempt at a solution to this dilemma by allowing you to get a good upper body workout with only a small assembly and your door. The Iron Gym works the entirety of your upper body by allowing you to perform several compound exercises: with this, you can perform pull-ups, maximum range push-ups, and sit-ups. While three exercises seem don't seem like enough to constitute a full workout, some variations you can perform with each exercise make the bar incredibly valuable as a complete upper body workout tool. 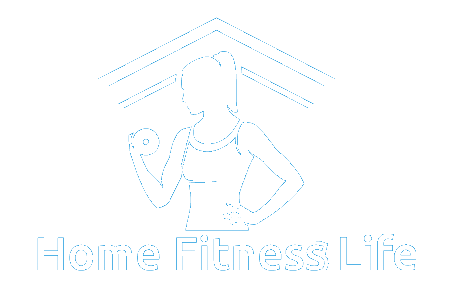 This equipment offers a variety of options for working out at home. It can be attached to the frame of a door for pull ups, it can be anchored to the bottom of the door for sit ups, or it can be flipped on its front for a full range of motion push-ups. It boasts a locking mechanism for assembly, so installation is a breeze. You won't need to waste your time with screws or fifteen-page assembly guides in another language. Safety brackets are also included in case you desire more stability while hanging from a door frame. Finding a way to effectively work all the muscles in your upper body using body weight alone is a very difficult thing to do in your home. Push-ups are easy to do, but they can often leave your wrists aching after only a short set. And crunches are so tough to do with proper form! Don't get me started on pull-ups; you can end up sleeping on the couch if your significant other catches you hanging from a bare door frame. That's why the Iron Gym Pro Fit is such an effective workout tool. It allows you to do push-ups with a grip instead of palms spread on the floor, allowing the the equipment to absorb most of the weight of the body. Crunches can be turned into sit-ups by placing the frame within the base of the door, and the bar's sturdy frame will force you to use good form. It can also be attached to the door frame for easy pull-ups without having to worry about door frame damage. If you don't have a degree in rocket science, breathe easy. This equipment is easily assembled and pops into place with a locking mechanism on the bar. Setup is accomplished in just a few easy steps. Are you worried about the stability of the equipment on the door frame? Don't sweat it. 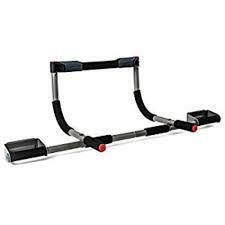 Iron Gym Total Upper Body Workout Bar comes with safety brackets to give you peace of mind. Some people have had some challenges building this equipment. In this video, you can watch someone quickly assemble it, but you can watch it on a lower speed setting to see what he does. As a stand-alone piece of home workout equipment, the Iron Gym is very effective tool for upper body workouts. The three-in-one workout model is the reason this workout bar scores so highly in design. It also can be easily stored in a closet and fits on most door frames, giving the bar a perfect score in terms of size. 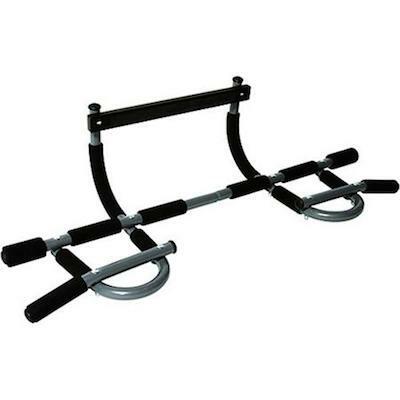 For the price of the product, the Iron Gym Total Upper Body Workout Bar is very good value. For a price that ranges around $25, you can buy a standalone piece of upper body workout equipment for your home gym. At that price, you can even consider expanding the size your home gym! 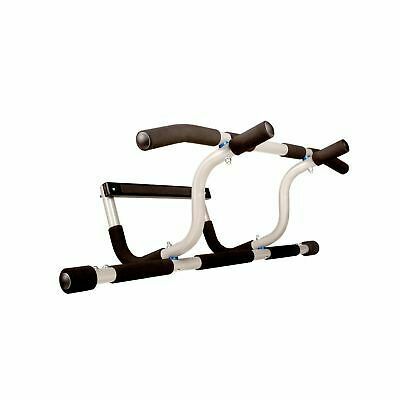 Because of this value relative to cost, the Iron Gym Workout Bar garners a perfect rating for price. This workout bar gets a slight hit to its features score because the bar height is not adjustable, but the use of a chair to reach the bar will easily fix this problem. The biggest knock to the Iron Gym Total Upper Body Workout Bar is that there is no warranty data listed on the manufacturer's website. This isn't entirely surprising for a product that hovers on the cheaper side of workout equipment, but it's still important to keep in mind. As far as the design is concerned, the ProSource is going to give you the same flexibility in your workouts when compared to the Iron Gym Bar. The ProSource seems to have a lot more quality control issues than its peer, however. The parts that come in the box don't always fit together properly or safely. In addition, the front bar tends to dig into the door frame and deform it, a problem that the Iron Gym doesn't experience. The Extreme Edition of the Iron Gym is about $15 more than its "vanilla" counterpart. For the money, you get a few extra variations for pull-ups and push-ups, with the added benefit of being able to perform dips. The standard features of the Iron Gym are still present in the extreme edition, so if you think the added exercises are worth the extra money, you should go for it. The standard Iron Gym will still be a great tool, especially if you are just starting out in fitness. Learn how with these workouts. Looking for more tips to get the most out of your Iron Gym? Check out my recommendations for the best Iron Gym workout. As far as size is concerned, the Perfect Fitness Bar and Pro Fit Iron Gym Bar are very similar. The Perfect Fitness Bar has some added benefits, however, including an adjustable height and an increase of 50 pounds of weight capacity. It does cost more than the Iron Gym, but not by much. The Perfect Fitness Bar has had a great deal of quality control issues in the past, making it a more risky buy than the Iron Gym Bar. The Yes4All has a design that is very similar to both the Perfect Fitness Bar and Iron Gym Bar. It has 50 pounds more carrying capacity than the Iron Gym Bar and helps with consumer confidence by offering a one year warranty. If you are hesitant about buying a workout bar because you fear quality control issues, the Yes4All Bar is most likely for you. If you want to save around $5 and still get a very reliable product, you might want to stick to buying the Iron Gym Bar. 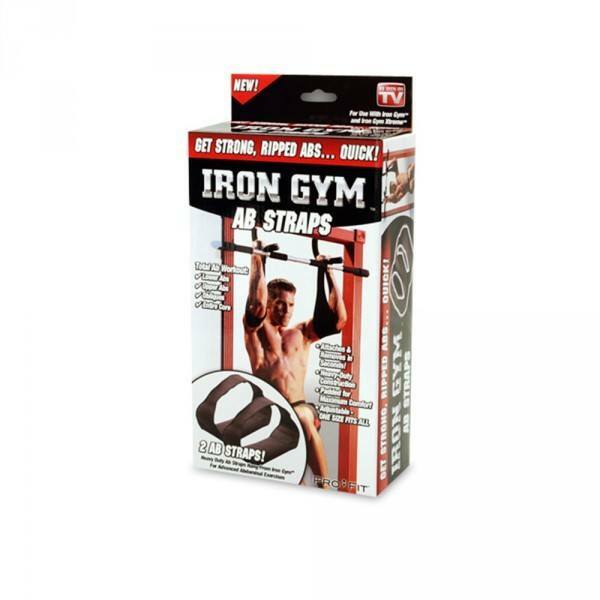 As seen on TV, these accessories these Iron Gym ab straps will help you strengthen your core. These straps are adjustable, turning your Iron Gym into an abdominal exercise gym. They’re easy to attach and remove, come with heavy-duty construction, and support up to 300 pounds. The padding inside will keep you comfortable will you work your lower and upper abs and obliques. Iron Gym Ab Straps vs. Waccess: Some people might be tempted to get the Waccess ab straps instead of the Iron Gym accessories because they appear to be cheaper. I don’t recommend them. They have close-ended straps, and they’re not very comfortable. How much weight can the Iron Gym Support? The Iron Gym can support a maximum user weight limit of 300 lbs. 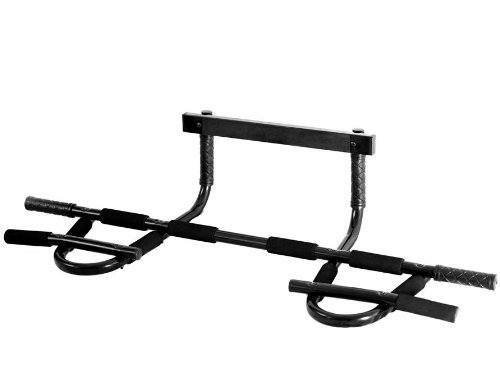 Should I buy the Iron Gym Workout Bar? 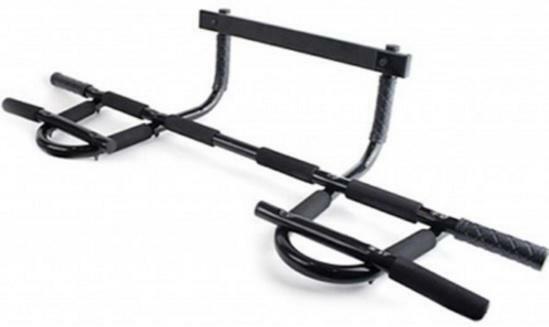 Based on price and simplicity of setup alone, the Iron Gym Workout Bar is a remarkable tool for in-home workouts. Regardless, if you don't see yourself ever doing pull-ups, or you wish to focus on the lower body during your workouts, you might want to look elsewhere for a piece of home workout equipment and get more value for your money. If you're interested in getting better at pull-ups and overall fitness, or if you're already a fitness pro, you should consider buying this bar. For the money, the Iron Gym Workout Bar is an incredibly efficient body weight workout tool and a great start for your home gym!